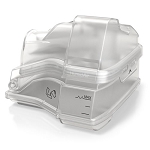 Included with the AirSense 10 is expiratory pressure relief (EPR). EPR provide a natural breathing experience during your therapy. The machine will detect whenever a patient exhales and reduce incoming pressure during inhalation. Patients can choose to reduce pressure by 1, 2, or 3 cm of H2O. Then, after the exhalation, the pressure returns back to normal. Sometimes a patient may experience a disturbance that lasts upwards of ten seconds. In these cases, EPR is shut down until the user returns to a normal respiratory cycle. EPR can be turned on and off at the patients discretion. The all new AutoRamp feature with sleep onset detection is available on this machine and can be turned on and off anytime. The AirSense 10 will deliver a low amount of pressure - beginning at 0 - as you fall asleep. With onset sleep detection, the machine will ramp up the pressure once you have successfully fallen asleep. 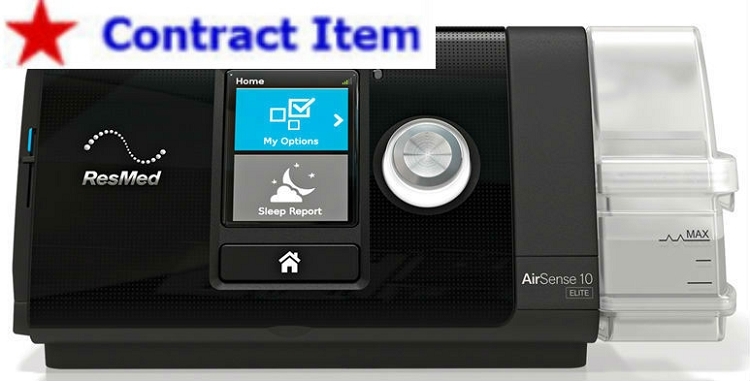 The interface for the AirSense 10 is simple to navigate and possesses a brightly lit, LCD display. Also built into the machine is an ambient light sensor, which changes the brightness on your screen based on the amount of light in the room. This means patients can rise in the middle of the night, and their screen won't light up and wake your sleeping partner. The backlight also automatically turns off, making it easier to fall asleep. ClimateLineAir heated tubing is available for optimal humidification. The ClimateLineAir tubing is different than the ClimateLine tubing used on the S9 and the two are not interchangeable. This tubing is significantly lighter and slimmer than your general tube, and will not interrupt you during your sleep. However, users can also purchase the ClimateAirLine tubing, which is a heated tube that works with the integrated humidification system to limit adverse side effects like rainout.